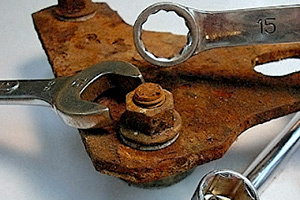 Corroded, stuck, burnt and rusted joints are always a problem, especially in the car with a significant run. Products of the oxidative reaction have an ability to multiply in volume. As a result, the joint is firmly stuck. Also contaminations and fine silt getting into the joint frequently increase friction between the mating parts. To solve this problem it is recommended to use agents with high penetrability, which can drastically reduce friction and dissolve the contaminations.